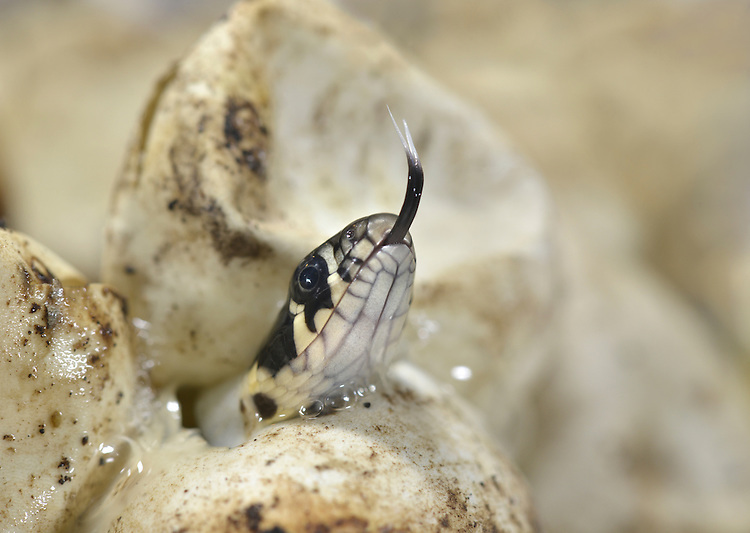 Grass Snake - Natrix natrix - young emerging from egg. Length 60-90cm Large non-venomous snake. Hibernates October-April. Hunts on land but also active in water, feeding on frogs and fish. Female lays eggs, often in composting piles of vegetation. Adult has slender body, thickest towards middle evenly tapering towards tail. Ground colour on upperparts is olive-green; has occasional dark vertical stripes on flanks and double row of indistinct dark spots down back. Neck has black and yellow crescent-shaped markings on sides, forming incomplete collar. Scales on under surface are whitish with dark chequering. Has backward-curved teeth that retain struggling prey. Eye has round pupil. Juvenile resembles tiny adult with relatively larger head. Hisses if distressed. Locally common in grassland and heathland, usually in vicinity of water.